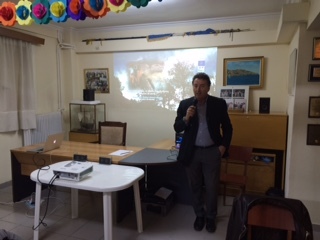 As part ofthe promotional programforLife Andros (ANDROSSPA), which is realized with the contribution of the LIFE financial instrument of the European Union, on Saturday the 9th of April, the project was presented in the lecture hall of Andros’ Society “To Korthion” at 19 Digeni Akrita street in Athens. 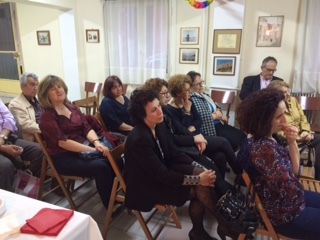 The presentation was attended by members of the Society and members of the Cultural Association of Strapourgies, Lamyra, Mesathouri and Ipsilou villages “Agios Nikolaos”. This was the 3rd presentation that took place in Athens and its objective was to inform and increase awareness of cultural associations and clubs of Andros island about the actions of the Life project. The first two societies to which the project had been presented were the Andros Society and the Andros Society in Piraeus. Present in the event was the Mayor of Andros, Mr. Theodosis Sousoudis, who presented the goals of the project and its realization progress. Mr. Isidoros Nikolaou, the head of Life Andros, presented the actions of the project, discussing in details everything that has been already realized and the actions that are scheduled to be concluded until the end of the project (31st of August 2016). 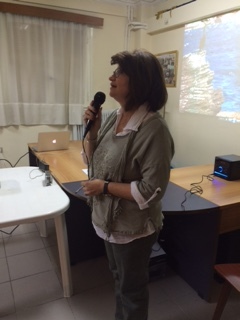 Following the presentation, the Society’s members watched the thirty-minute long documentary “Protecting the nature in Andros”. The documentary was sponsored by the Life project and promotes the natural beauty of the island. Most importantly, the documentary features Mr. Nigel Marven, a Discovery Channel reporter, who visited the island to document the life and reproduction cycles of Eleonor’s falcons. After the video, the members of the Society had the opportunity to ask questions and discuss about the project. Responsible for organizing the event and coordinating the discussions was the communication manager of the project, Mr. Giannis Mindrinos. The Municipality of Andros and Life project wish to thank the President of the Society, Mrs. Katerina Papatheofanis and the President of “Agios Nikolaos” Association, Mrs. Maroulitsa Daniolou for their hospitality.